There are lots of Spider-people in the Marvel Universe right now. But only two of them call themselves Spider-Man. One, of course, is the newly-rich Peter Parker, originator of the wall-crawler identity. The other is an alternate-reality successor to the Spider-mantle named Miles Morales. This week, we see Miles play a pivotal role in the last superhero battle of the Ultimate Universe. Peter Parker died in Miles Morales’ native reality, victim of injuries suffered at the hands of archenemy Norman Osborn/Green Goblin. But months before Parker’s death, Miles had gotten bitten by another genetically engineered spider like the one that gave his predecessor his powers. His adventures have been happening for years now and the character’s debut has proven to be the most lasting artifact of Marvel’s Ultimate Universe imprint. 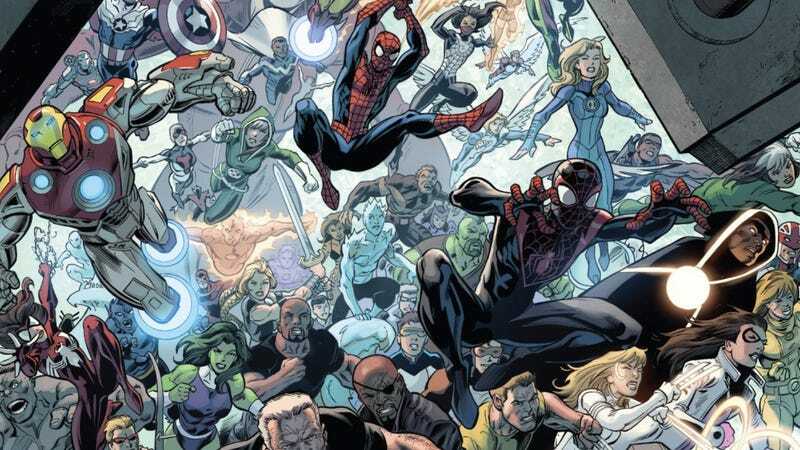 The Ultimate Universe, which debuted in 2000, was populated with modernized interpretations of the publisher’s superheroes, some of whom had slightly different origins and appearances. But, despite high-stakes storylines that made the alternate reality radically divergent from the mainline one, enthusiasm for the line flagged. The powers-that-be decided to shutter the Ultimate-verse via a big crossover event called Secret Wars. That series has thrown together characters from a slew of dying realities on a composite planet created by an omnipotent Doctor Doom. In the Ultimate End miniseries—by Brian Bendis, Mark Bagley and others—heroes from mainline reality Earth-616 and the Ultimate Universe’s Earth-1610 find themselves shoved up against their counterparts. The different versions of Captain America, Hulk, Iron Man and others are superheroes dealing with an unknown set of circumstances so, of course, they fight each other. But Miles—who survived the end of everything and Doom’s ascendance to godhood in an extra-dimensional life raft—explains that they’re from different realities. After that revelation, the assembled heroes act according to their nature and go and fight the bad guy. The amount of fear and doubt in Ultimate End #5 makes the last moments of the Ultimate Universe unexpectedly poignant. We don’t see the final showdown with Doom and how the Marvel Universe gets revised into its current new form. But we do see that Miles survives, waking up in a new world. And the great tragedy of his young life—the death of his mother during his first set of superhero battles—has been undone. Right now, it’s an open question as to how Marvel’s going to treat Miles’ backstory and whether this Spider-Man will remember what happened in the alternate reality where he was born. Will he or Peter Parker remember his old life? Will he have a different origin story? These questions will get answered in the February-debuting Spider-Man series that serves as Miles’ solo book. But, he’s already been shown as a member of the newest core Avengers squad. Most of Marvel’s other Ultimate characters will be fading from view but Miles Morales likely has an important future ahead of him.